Tucson police officers stand by a police car with a man detained in the back seat following a shooting on Nov. 29, 2018 in Tucson, AZ. The shooting occurred in the 2600 block of North 15th Avenue and involved U.S. marshals. A Tucson Police Department Officer stands by his police car outside the house where Ryan Schlesinger is holed up following a shooting on November 29, 2018 in Tucson, AZ. In addition to sending emails to officers, Ryan Schlesinger sent threatening emails to a Pima Community College administrator who had placed him on probation in March 2017. Tucson police served an order to Ryan Schlesinger to get him to take a mental-health evaluation in August 2017 at the same home where Deputy U.S. Marshal Chase White was killed Thursday. Deputy U.S. Marshal Chase White was shot and killed serving a search warrant in Tucson on Nov. 29, 2018. A deputy U.S. marshal serving a felony arrest warrant was shot and killed Thursday evening outside a house on the city's north side, Tucson police Chief Chris Magnus said. The man suspected of shooting the marshal was arrested after a standoff at the house. A federal complaint filed in court said he was wearing body armor and a ballistic helmet when he was taken into custody. Magnus said the Marshals Service was serving an active felony arrest warrant against a man at the house when the suspect fired at them. Marshal Service personnel returned fire, but the suspect was not wounded. Magnus said the warrant was issued by Tucson police and was being served on Ryan Schlesinger, 26, on charges of stalking a law enforcement officer. Magnus would not release details about the warrant against Schlesinger. The federal agent, identified Friday morning as 41-year-old Chase White, was the first deputy U.S. marshal to be killed in the line of duty in Tucson in 66 years, according to online records kept by the Marshals Service. The shooting happened around 5:30 p.m. in the 2600 block of North 15th Avenue, near West Jacinto Street. The house where the shooter fired from is just across the street from Jacinto Park, and northwest of North Oracle Road and West Grant roads. A federal complaint filed Friday said as marshals arrived at the house they noticed there were security cameras on the outside of the residence. As they forced their way into the home, Schlesinger opened fire, striking White. Other marshals returned fire and dragged White from the home. Moments after the shooting, Tucson police and federal officers surrounded the single-story house. Several residences around the house and the park were evacuated by officers. After about an hour standoff, Tucson police reported they had a man from inside the house in custody. The federal complaint said Schlesinger was wearing a ballistic vest and helmet when he was taken into custody. White was taken to Banner-University Medical Center where he died. "This is a tragic night for law enforcement in Tucson and across the state of Arizona," Magnus told reporters late Thursday. "This is very tough." The federal complaint said Schlesinger was upset with Tucson police officers after an incident in August 2017 at his residence where officers where trying to serve an emergency mental-health petition. At the incident, Schlesinger threatened to kill the officers. He was Tasered and taken into custody. Officers confiscated his Glock handgun and ammunition. Over the ensuing months Schlesinger sent Tucson police emails demanding that his gun be returned. He even showed up at the Miracle Mile police station to make a "citizen's arrest" of the police officers involved in the initial incident, the federal complaint said. Schlesinger also show up at the parents' house of one of the police officers, the complaint said. Gov. Doug Ducey tweeted shortly after 8 p.m. that he had been informed the deputy U.S. marshal was killed in the line of duty. "I’ve just learned that tonight we lost a US Deputy Marshal from the District of Arizona. He was killed in the line of duty in Tucson. My deepest condolences and prayers go out to his family and all of Arizona law enforcement," Ducey tweeted. Friday morning, the Acting Deputy Director of the U.S. 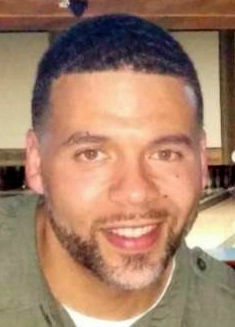 Marshals Service David J. Anderson said, "Chase was devoted to making his community and this nation safer. His sacrifice will not be forgotten." Online court records show Schlesinger has a court date scheduled for Dec. 5 on charges of harassment by communication. The last deputy U.S. marshal to die in the line of duty in Tucson was Edmund L. Schweppe, who was fatally shot while escorting two prisoners to a dentist office in the downtown area on Sept. 15, 1952, according to the Marshals Service website. The two prisoners were apprehended by police after they escaped. They were both convicted of Schweppe's murder and sentenced to life in prison, according to the Marshals Service. I’ve just learned that tonight we lost a US Deputy Marshal from the District of Arizona. He was killed in the line of duty in Tucson. My deepest condolences and prayers go out to his family and all of Arizona law enforcement. Deputy Marshal Chase White was an Air Force reservist who was preparing for deployment.